Looking for the best 2 days in Santorini Itinerary? 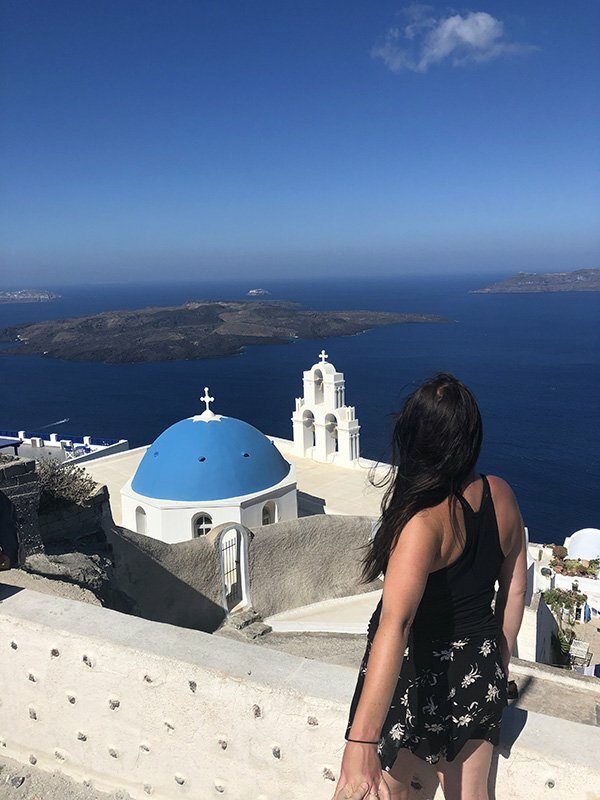 Whether you are planning on visiting for one day, two days, or 3 days in Santorini, I have put together the best way to maximize your time on this beautiful Greek Island and you can follow it exactly, or pick and choose what suits your travel style and the amount of time you have on the Island. Santorini is one of the Cycladic Islands of Greece and one of the most beautiful. Its beauty makes it one of the most popular and you will find people from all over the world enjoying their honeymoon or taking advantage of a cheap flight for a long weekend getaway. 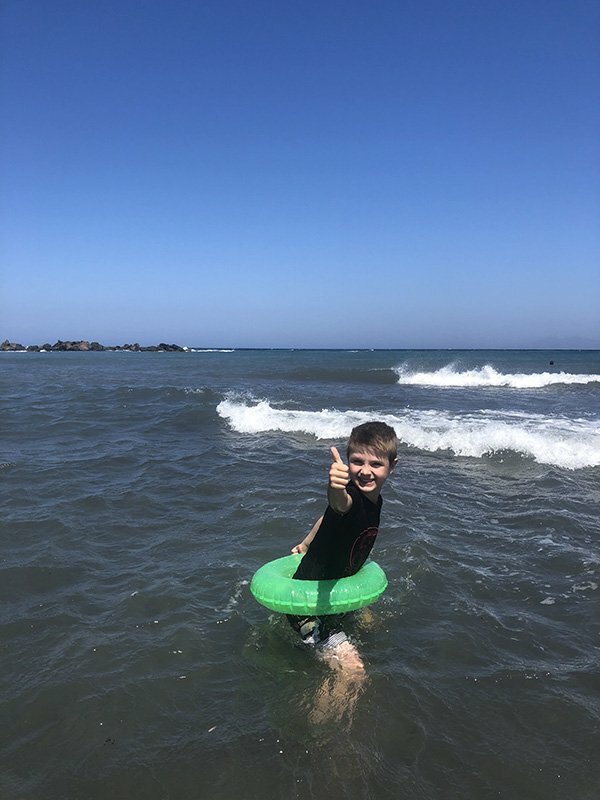 You will also find people like me, island-hopping on holiday, taking in the natural beauty of the island, exploring the labyrinth of pathways and finding some fun for my kids while we spend 2 days in Santorini. I am often asked if 2 days in Santorini is enough time to see an experience the Island. 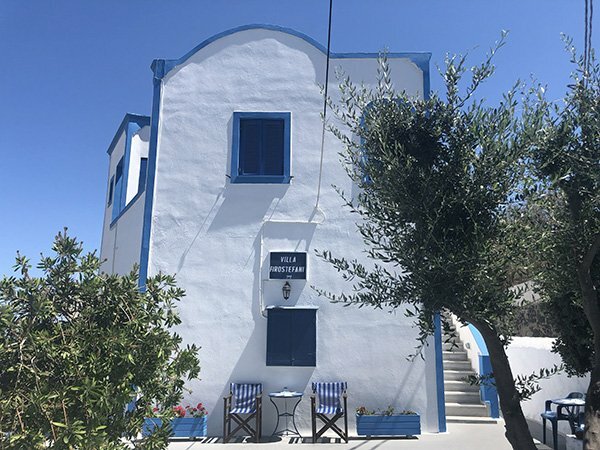 In my opinion, yes it is enough time to see the top sights, enjoy the stunning views and get a good sense of the vibe of the island, known to many as Thira. While this itinerary moves at a relatively quick pace, if you want a day or two of relaxation near the beautiful Aegean, just choose to stay 3 or 4 days in Santorini. 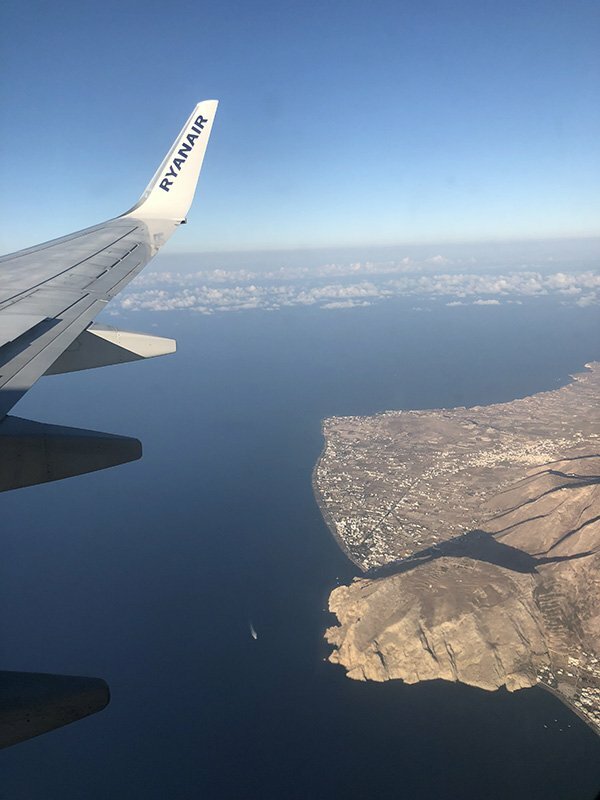 Suprisingly, I am also often asked “Is Santorini Safe?” so I wrote a blog post about safety. You can read it by click the link. 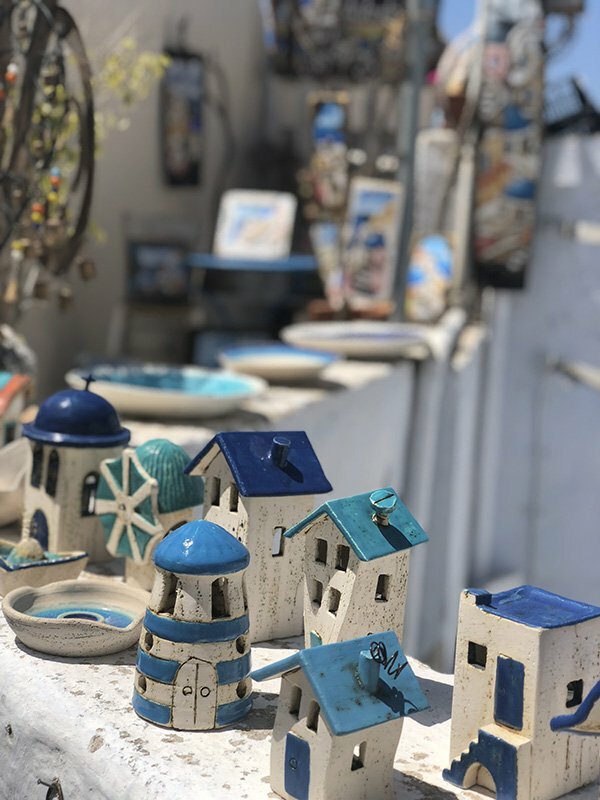 You can also read about what to buy in Santorini as I am often asked about Greek souvenirs. The first think that you will notice when you are planning a Santorini itinerary for 2 days is that Google uses the Greek alphabet and Greek names for all of the places. It has not anglicized them. This is true for all of Greece and even the road signs do not say “Athens” but rather “Athina” and “Αθήνα.” And Fira, the capital and pronounced “th” not “f” is also spent Thera or Thira. It can get really confusing. And those are not even with Greek letters! While everyone I came across in Santorini spoke perfect English, having Google maps in Greek made for a bit of a challenge. When you arrive, take note of where you are staying in Greek, so you can find your way back home at night! I like to drop a pin at our hotel and if I have booked my hotel with my gmail account, Google Maps seems to be smart enough to know I am staying there and it shows it on my map! Now on to the more exciting things. 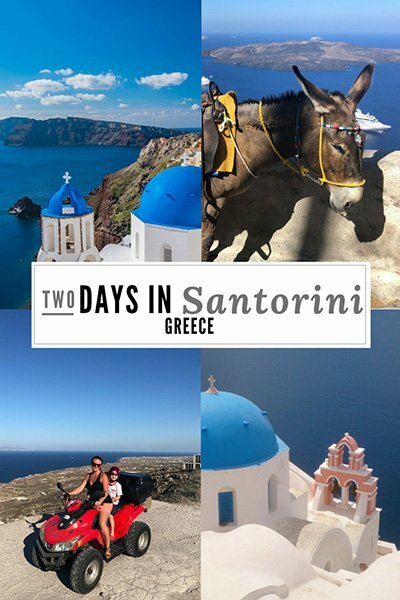 I am going to show you how to see all of the top sights in Santorini in 2 days. 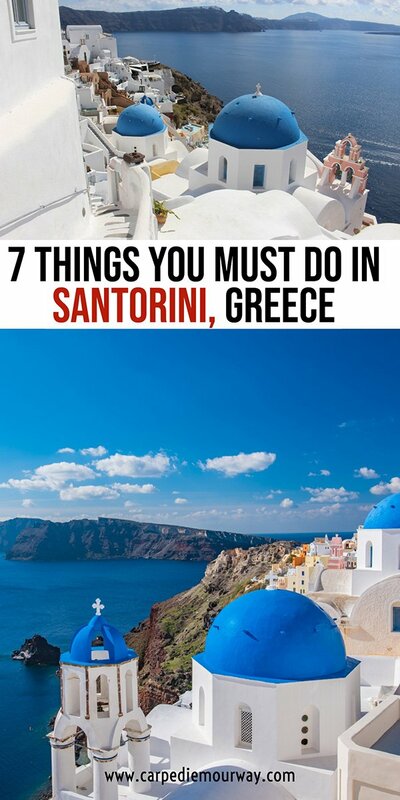 It includes the stunning cliffside photo ops that make Santorini so famous, the best beaches to visit, and the tours that are worth your money. It does not matter where you are staying on Santorini, you can make this two days in Santorini itinerary work. Day 2: The Second day of your Santorini Itinerary involves boats, beaches, volcanos, hot springs and sunsets. If you are spending 2 days in Santorini, you will either be coming in by ferry, by plane, or by a private boat. Santorini is a popular cruise ship port on almost any Greek Cruise, but likely you will be on the island for just the day. If you are arriving by plane, you will arrive into Thira Airport (JTR) which is served by over 60 airlines. It is a small airport and looks like something lost in the 1980s, but serves the needs of the island and it is quick to get your luggage and get out! We chose to fly into Santorini in order to maximize our 2 days in Santorini, rather than waste time traveling. I also found a cheap fare on Ryan Air. It was just 50 minutes to reach the Island from Athens International Airport and an early morning flight meant that we could drop off our luggage at the hotel and spend the day exploring! JTR is on the East-Central part of the Island and about 6 km from Fira, the Island’s capital. It takes about 15 minutes to reach Fira. When you arrive you will need a transfer to your accommodation. There are taxis, rental cars and public busses. The taxis want about 25 Euros to take you into Fira, and the bus is less than 2 Euros per person. But the busses are not frequent. We decided to take the bus route, and it was at least an hour wait. Many hotels also offer transfers, if your hotel does, I suggest you take it, it is the most convenient way to get to your hotel with your luggage. We took the bus which meant walking about one kilometre to our hotel, but most of that was UPHILL! There are no flat roads in Fira and we found out the hard way! You can also book transfers here. Arriving by Ferry is a popular way to start your 2 days in Santorini. This is one of the fast ferries. Several ferry companies service Santorini daily and they all arrive into Athinos Ferry Port, which is the “new” port. Cruise ships arrive into the old port and visitors can either walk, take a donkey taxi, or take a cable car to the cliffs of Fira. There are two types of ferries that service Santorini: Regular and Fast. The Regular ferries (Blue Star for example) takes about 8 hours and the Fast ferries take about 5 hours. 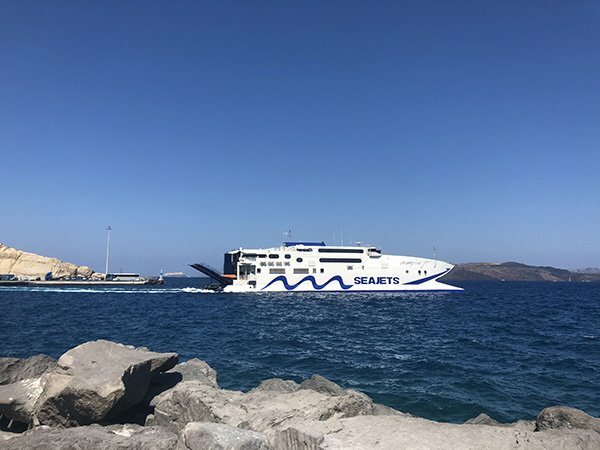 On Blue Star ferries, it takes about 8 hours from Athens by ferry to get to Santorini (with a few stops on the way), so take that into consideration when you are planning. We chose to fly, partially because I found cheap flights with Ryan Air, but partially because we did not want to have a long travel day after having a long travel day visiting Meteora the day before. Check out our post on Visiting Meteora if you are planning on visiting while in Greece. Blur Star is a very comfortable very line, with couches and comfy chairs and a variety of food and beverage options. It is more like a nice cruise than typical boat travel. It also has a fleet of large vessels which means that you will not feel the rough water as much as if you are on a catamaran. BUT that does not mean you will not feel it. We had a rough sailing from Naxos to Kos and I was glad I was prepared as the ship swayed from side to side. Arriving into Athinos Port there is a steep, winding road to get you up to the top. There is public transportation, taxis and private shuttles. You can also rent a car in advance and pick it up at the port. Sometimes there is not room on the bus nor is there taxi’s available. Especially in high season. As I mentioned above, if your hotel offers a shuttle, I suggest you book it in advance. You can also book transfers here. 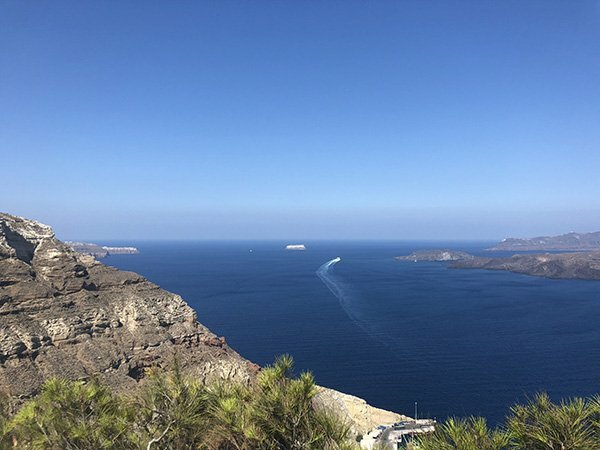 Santorini island has ferry connections with the following ports; Piraeus port (Athens), Ios, Naxos, Paros, Crete, Mykonos, Tinos, Syros Rhodes, Anafi, Chalki, Diafani, Folegrandos, Kos, Kasos, Kea, Kimolos, Koufonissi, Kythnos, Lavrio, Milos, Serifos, Sifnos, Sikinos, Thirassia. 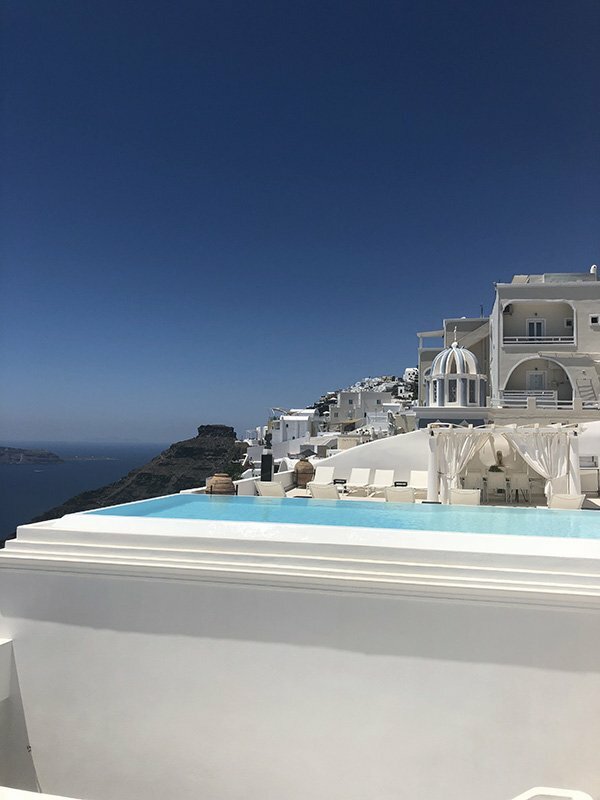 There are all types of accommodations in Santorini, from luxurious 5 star hotels with private pools and beautiful Caldera views, to budget accommodations. Generally the most expensive places to stay are in Oia and Fira and as you move away from the sea cliffs, prices will decrease. If you are traveling in July or August, I highly suggest you book your accommodation in advance. The earlier the better! There are hundreds of places to stay in Santorini but most of them are small, boutique style accommodations with less than 20 rooms. 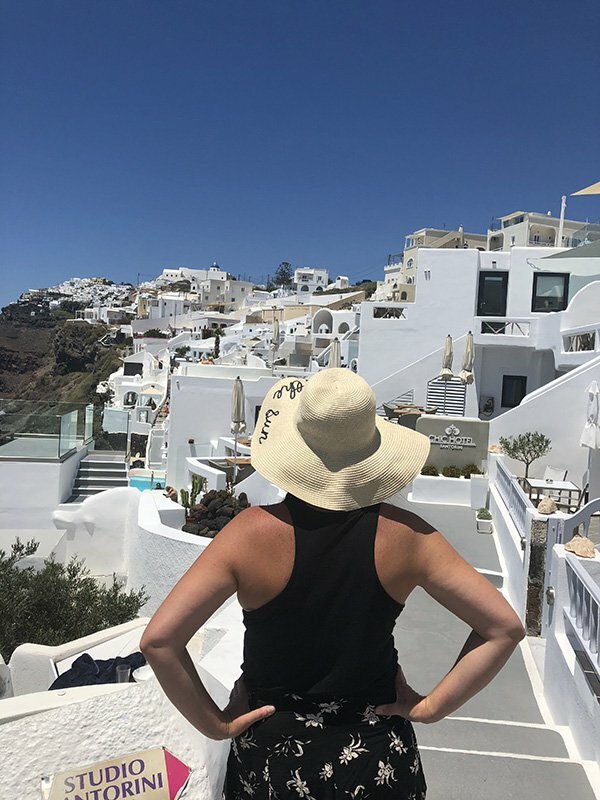 If you plan on relaxing and spending some time enjoying your room, I recommend staying on the Fira cliffs, although the Oia cliffs are amazing as well. I prefer the more central location of Fira. You can get a room with a private pool and amazing views. It is the ultimate relaxation. BUT NOT THE ULTIMATE PRIVACY. Because of the steep cliffs and the labyrinth of access to the rooms, hundreds of tourists will likely pass by your balcony as you relax in your pool. 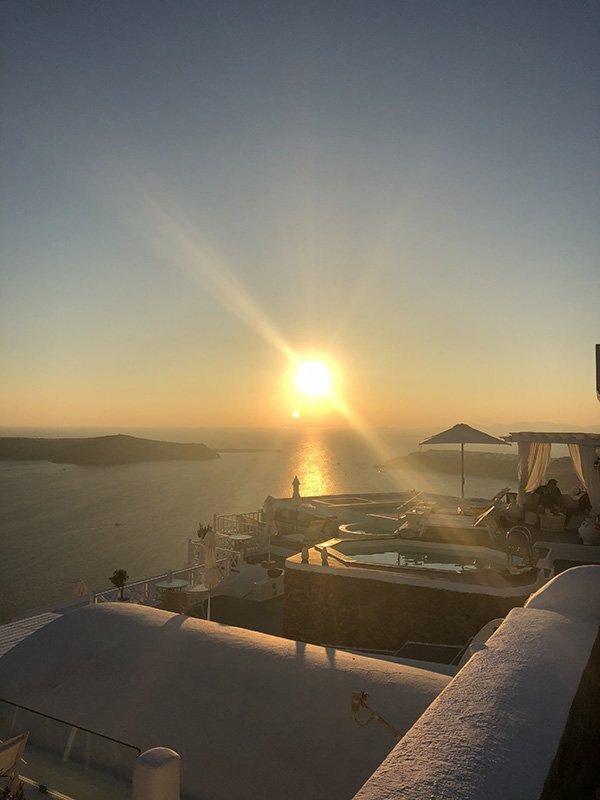 If you only have 2 days in Santorini, you might find that you do not have enough time to really enjoy your room that you paid so much money for, but if you have 4 days in Santorini you should have plenty of time to enjoy it. Fira, the capital of Santorini is a central place to start your 2 nights in Santorini. That is why I recommend staying in Fira. It does not matter how you got to Santorini, you have to transfer somewhere, and Fira is the easiest. If you took the bus, it stops at the main station and you can walk to your hotel (be warned, it is probably uphill). If you came by hotel transfer or taxi, you can easily drop your luggage and begin exploring. 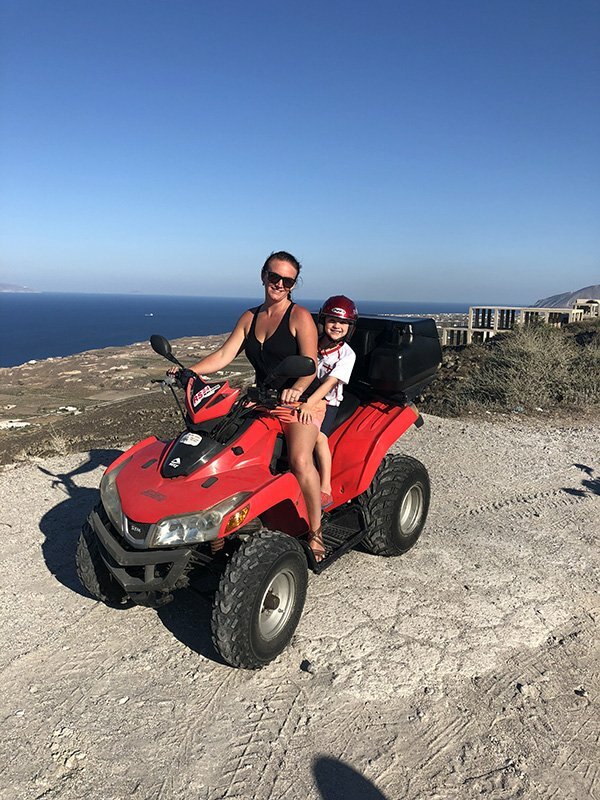 My favourite way to explore Santorini in 2 days is to rent an ATV for one of those days. Rental agencies are everywhere. Make sure you have obtained an International Driving Permit in advance. Before you head out of town Visit the Three Bells of Fira and take your own Santorini Instagram Photo as you wander the cliffside town. There are plenty of restaurants with beautiful views. Popular ones, like Galini’s will take reservations in advance. There are countless photo stops in Fira, but atop the Three Bells is probably the most popular. Pyrgos is another whitewashed town with stunning views and the former capital of Santorini. Put it into your GPS and get yourself used to your ATV. Once you arrive, park and wander the main square, which has quaint coffee shops and climb the labyrinth of alleys in search of trinkets and small galleries. 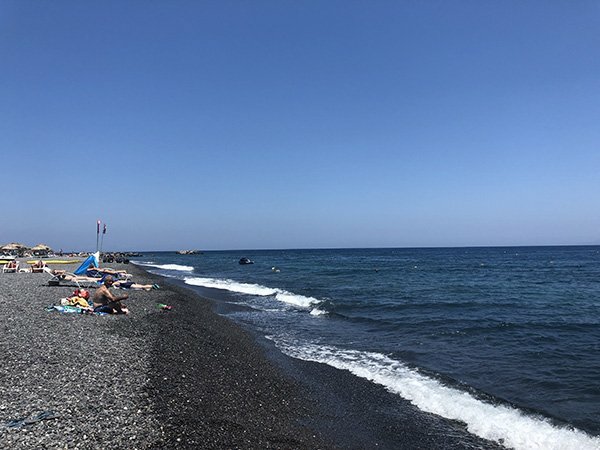 Kamari Beach is one of the most popular beaches in Santorini and it is covered in Black Rocks. Hundreds of sun bathers enjoy the lounge chairs and swim in the warm waters. We stopped and had a swim, but did not bother paying for the use of a lounge chair. Beware that the rocks get extremely hot and do not try walking barefoot on them. After a stop at Kamari Beach, visit nearby Monolithos beach and see the black sand. It was much less crowded when we visited but was also very windy. There were dozens of windsurfers enjoying the waves. Monoliths beach is nicer on your feet as it is sand and it is quite shallow. Most of the Wineries are inland and having the ATV makes it easy to go from one place to the next. You can space them in-between your beach visits. If you want to make things easier, enjoy this Sunset wine tour that has pick up and drop off service. It allows you to enjoy the stunning sunset views that you came to Santorini for and fits well into a 2 days in Santorini itinerary. If you want to kick back and let someone else do the driving there is a popular full day tour of Santorini. You can check it out here. Get up early and enjoy breakfast with a view. 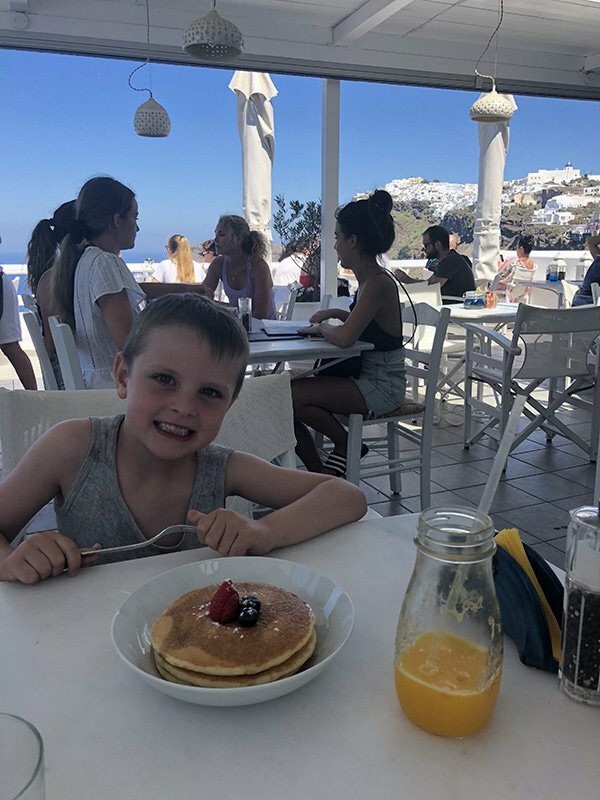 It gets sunny fast in Santorini, and hot too, so an early breakfast cliffside will mean you beat the crowds who have slept in. After breakfast, take a Boat Tour and Cruise the Caldera to an active volcano, a hot springs and an unforgettable day on the water. This allows you to swim in the crystal clear waters and admire the cliffs that make Santorini so special. If you book this tour you get the option to extend it to watch the sunset at Oia. While it may make for a long day, you do not have to worry about any transportation, as the tour will take you back to your hotel after. If you want to go out and enjoy the Fira nightlife or relax in your room, the choice is yours! 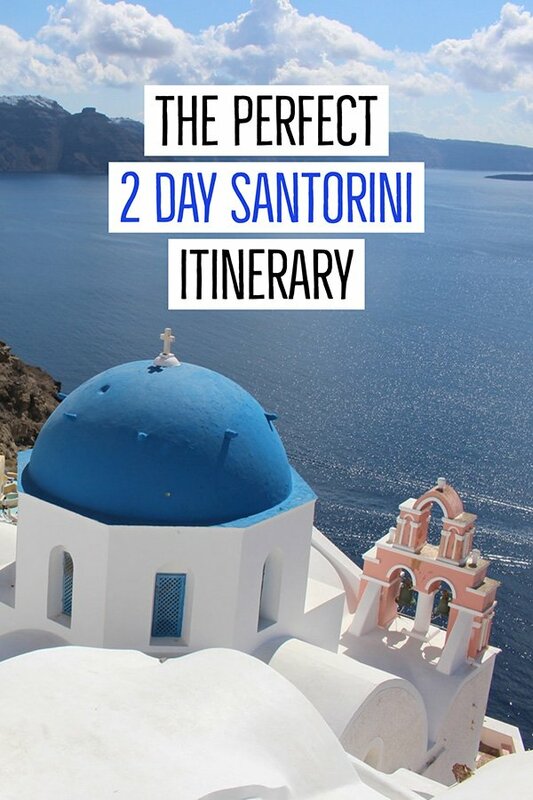 It is your 2 days in Santorini! If you happen to have 3 days in Santorini I suggest you add the popular Fira to Oia hike on your third day. Three days is popular for visitors to the island. It gives you more time to relax and soak up the vibe of the island. Choose another great restaurant to watch the sunsets and enjoy a few more hours looking at the view. There is for sure, no WRONG amount of time to spend in Santorini. Is one day in Santorini enough? Well, in my opinion, One night is enough, you can jam a lot into 2 full days and then leave on a late flight or late ferry. If you are tight on time and do really only have one day I suggest taking a boat tour and getting out on the water. This way, you get to enjoy the stunning Caldera and you can see why the cliffs are so magical as you see them from the water. You get to see the volcano, the hot springs and can enjoy a sunset in Oia. If all day on the boat seems like too much and you only have the one day, I suggest this afternoon cruise. It means you can explore Fira in the morning and then enjoy the water in the evening. Check out this great article on the Best of Santorini from World Travel Bug. Do you have any questions about spending 2 days in Santorini? 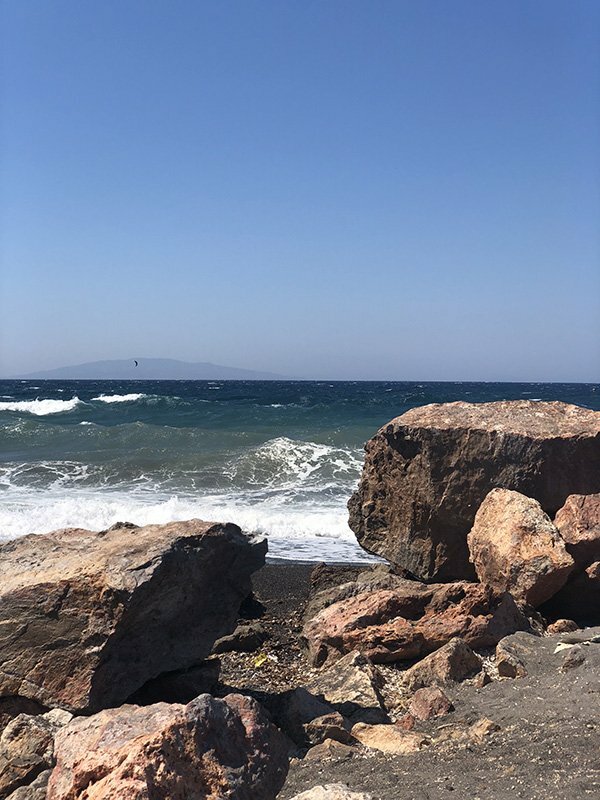 2 days in Santorini really is enough to get a feel of the island, enjoy the stunning views and then hop on a ferry and explore another one of the beautiful Greek Islands. Pin this 2 days in Santorini Itinerary for later! Lindsay is the founder and editor of Carpe Diem OUR Way. 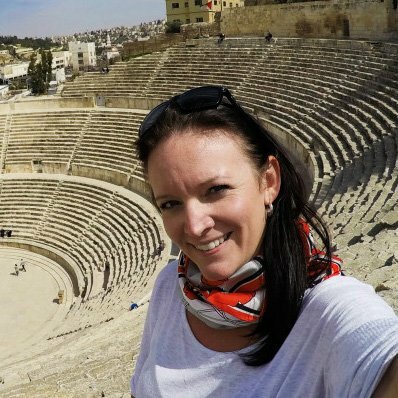 She is passionate about sharing her experiences of traveling with children on adventurous family holidays around the world! She resides in the suburbs of Vancouver when not jet setting abroad. Hi and welcome to Carpe Diem OUR Way! I'm Lindsay and I am addicted to being a foreigner! Hopefully my posts on travel and my love for adventure as well as family travel tips will help make your next trip a great one! Are Jerusalem Hostels Family Friendly?